For Tisch, art-making is, first, a personal process – one which specifically enables healing – but she also thinks a great deal about materials and process. 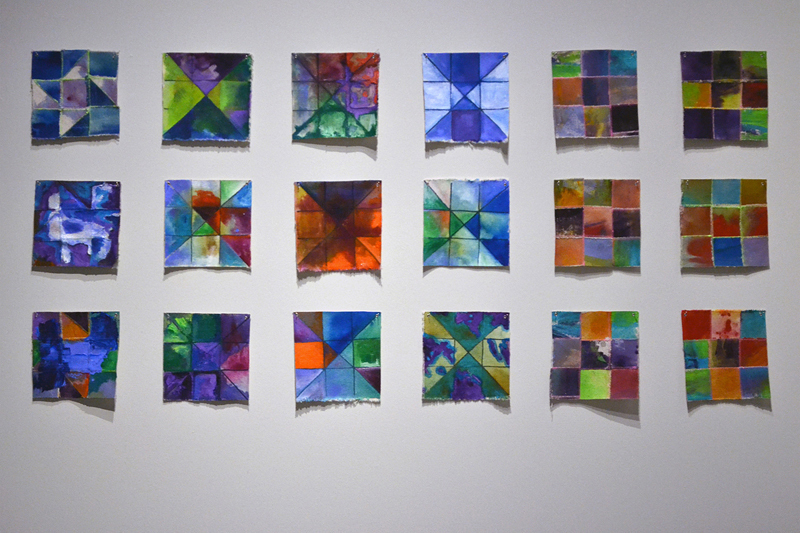 For her BFA thesis show, she sliced painted canvas into quilting blocks and reconstituted their elements, which are abstractions of elements of her body. There is a sense of self-work imposed on women, regardless of body-type, as well as an abstraction of certain body parts. Tisch accompanied these graphic pieces with two full-body portraits, and if one meditates on them, you might see elements of her body lifted and reconfigured in these quilting squares. 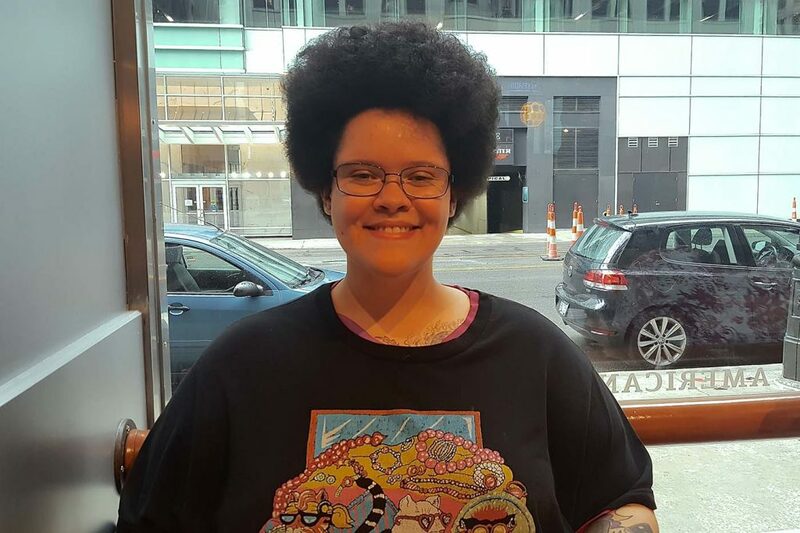 Tisch is a brave person – one of the few that has availed herself of the BWTA open call for breakfast invites. It’s scary to approach strangers, especially when one is a bit introverted (as I know I am). She spoke of the concept of “interactional vandalism” – that is to say, the mechanisms within human interactions that might leave one or all participants damaged in some way. This is an extremely powerful idea, to me, and one that fits extremely well with art work I am engaged in personally, as well as the increasingly tense pitch of interpersonal relations on a political, racial, and mass scale in the United States. Trying to develop an understanding that every human being is equally a person, attempting to take accountability for the ways in which we might damage each other in pursuit of self-serving outcomes, and then cultivating a real ability to care about each other as much as we care about ourselves…it seems this is not something that comes very easily to a lot of people. I know I have had to do a lot of work in my own life to have a broader sense of care for people, and it is work I continue to struggle through. It is easy to think that we will be happy if we get what we want – in fact, sometimes that just creates the need for more getting, more wanting. Tisch is a very warm and generous individual. While the art she makes is self-serving, inasmuch as it is a vehicle for her to heal intense experiences – such as witnessing her grandmother’s recent passing in a cardiac unit, or the petty vandalism of someone who never says goodbye before hanging up the phone – she also hopes that it lights the way for the healing of others. In this way, art becomes a conversation – not only with itself, which is the academic perception, but with society and the people within society. I often characterize myself as introverted, but lately I have come to consider that the time I spend “alone” is actually more often spent with objects or ideas created by other people. What does it look like to have a conversation with a person through the abstraction of a book, or a quilt, or a statue? It is still a human interaction, ultimately. Sort of like playing chess-by-mail. I think Tisch is brave, for putting herself out there. She understands well that there is no shortcut to success that omits doing the hard emotional work of putting yourself out there and getting rejected. It takes a kind of deep inner reserve to be willing to put yourself in line for a “no” as many times as it takes to get to “yes.” And it can take a lot of times. Tisch has shown work mostly in Saginaw, where she is based, but has longstanding family ties in Detroit, and has also shown at Hatch in Hamtramck. Keep it up, Tisch! I look forward to seeing more of you!